I was that kid at camp. When I was growing up, my family attended a family camp through our church at Lake Koronis. The camp had canoes you could check out and paddle to an island in the lake. But you were only supposed to go with a counselor. As a seventh grader, I convinced a new friend at camp to go Tom Sawyer and Huck Finn, breaking the rules and jumping into a canoe. Once we reached the island, thunderstorms started to roll in. There were whitecaps and whipping winds toppled trees. I remember the fear so vividly. When the storm calmed down, adults tracked us down. My father, on the other hand, dressed me down. Look at the results of your decision? You took a canoe without permission. You went to an island property, without permission. You endangered someone else. And, as a result, you get stuck in a storm — and things could have been much, much worse. It was a powerful lesson. He grounded me, and I had a lot less freedom at camp. The kids had a tradition of attending the church service then running to the canteen to get Orange Crush and Laffy Taffy. But more than being grounded, I learned a lesson about responsibility and honesty. I wanted to be adventurous and “pirate” my way to the island. But what if I weighed that decision through the Y values of honesty, caring, respect and responsibility? Was I honest with my camp counselor? No. Was I caring of the buddy I dragged into this? No. Was I respecting the rules? No. And was I being responsible? No. I made a mistake at camp. But I learned so much from that mistake. Which makes me often wonder: If our kids aren’t allowed to make mistakes, how are they going to learn? Even with a strong set of core values, our kids are still going to make mistakes. But with a support network holding them to a high standard, our kids will learn from mistakes — like I did — and make a better decision next time. 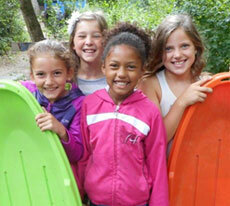 Camp was a big part of my childhood, and it’s a big part of my own children’s childhood. I believe camp should be an opportunity for all kids. Unfortunately, many kids don’t get enough opportunities for physical activity, learning or social interaction during the summer. Then, when school resumes, they face hurdles that prevent them from reaching their full potential. In his book Last Child in the Woods: Saving Our Children from Nature-Deficit Disorder, Richard Louv writes about the negative consequences to individual health as children move indoors and away from physical contact and the natural world. “Nature inspires creativity in a child by demanding visualization and the full use of senses,” Louv writes. The Y operates 10 day camps in the metro, four overnight camps in Minnesota and Wisconsin, two wilderness camps for teens and two family camps. We always look for ways to improve the camp experience for all, and one of the questions we wrestle with is this: Do we integrate technology into camp or go cold turkey on technology? We live in a plugged-in world, and there’s a growing challenge to limit screen time. Eight-year-old Sahil wasn’t too excited when his parents signed him up for a Y camp. Adventure, friendships, nature and fun. We could all use just a little more of each.